It’s been one of those weeks that seems to crawl by at the speed of light – the days go quickly but I wake up expecting it to be Friday when the calendar says Tuesday. I’ve been spending a lot of time at a desk due to my full-time job and the void that is photo editing so suffice it to say, my diet hasn’t been as stellar as I would like. My workday meals are great since I pack all of my food in advance and dinner is also good. My downfall is the time between when I come home from work and when I eat dinner. I get stuck in a snack rut of an apple + peanut butter or edamame since I like snacks that are protein rich, quick, and require little prep. On top of that, I usually can’t decide if I want something sweet, something salty, or something savory. Yesterday I finally found something, other than salted chocolate, that solves that problem and fits my snack requirements. Enter roasted chickpeas. They’re not new, the blog world has been buzzing with them for awhile now. 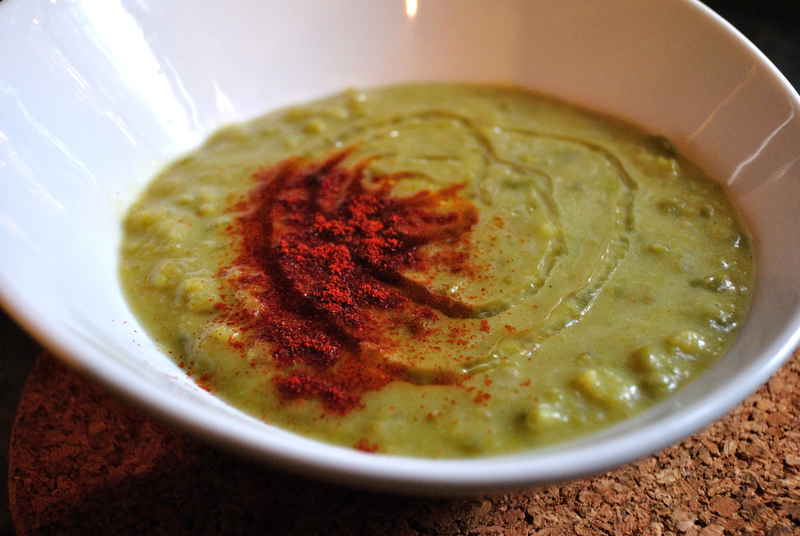 They’re not fancy, after all, it’s just a humble legume. But they are most definitely are amazing. 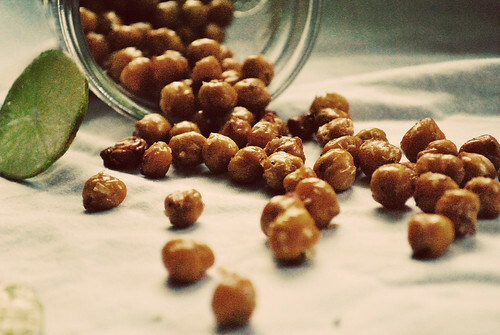 During a particular fit of indecisiveness (who am I kidding – I’m just incredibly indecisive all the time), I decided to change up my usual roasted chickpeas and give them a flavor boost. 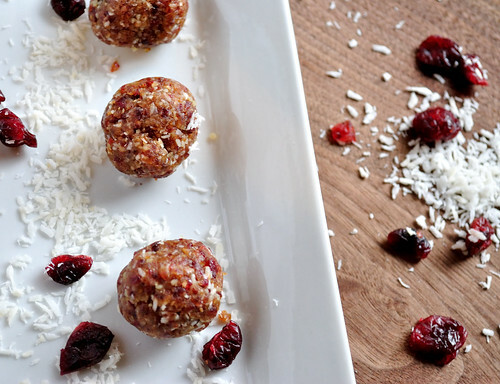 Healthy coconut oil gives them a faint sweetness while lime juice and zest give them a bright, energizing flavor. Give them a sprinkle of good sea salt and it’s salty, sweet, sour, crunchy bliss. 1. Preheat oven to 375Fand line a baking sheet with foil. 2. 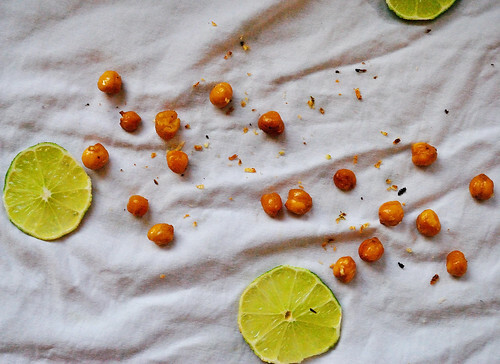 Using a paper towel, pat your chickpeas dry. 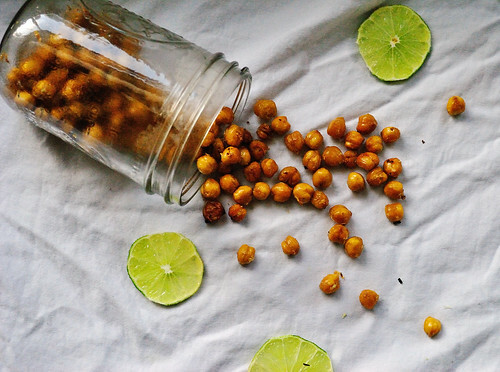 In a medium bowl, toss chickpeas together with melted coconut oil, lime juice and lime zest. Spread evenly on your baking sheet. 3. Roast for 15-25 minutes – it’s a bit of range but I find that it really depends on your oven. Turn your baking sheet half way through and giving them a quick shake to move them around. Shake a few more times if you oven has hot spots. 4. Let cool and store in an airtight container. I hope everyone had a great weekend! Did anyone do anything fun for the Superbowl? I had a fairly busy weekend so by the time Sunday night rolled around, I was ready to crash. The husband and I went to grab some pho and beer with my parents and then called it an early night. We’re super exciting people, I know. This week I thought I would do something new and institute a new fixture on the blog: “Meatless Mondays”. I’m not a vegan or vegetarian but I do prefer to limit my intake of animal products for various health and environmental reasons so I think this feature will be a good way to come up with some new exciting recipes. For this week, I’m going to do a quick recipe round-up of some of my favorite vegan and gluten-free recipes. 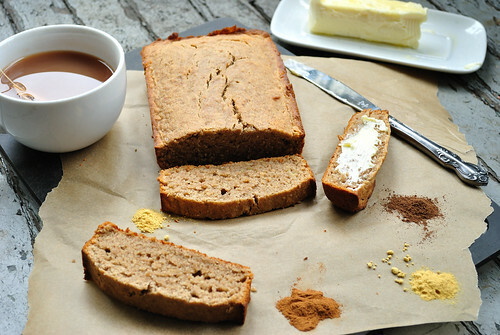 Vegan Chai Banana Bread: My favorite banana bread! 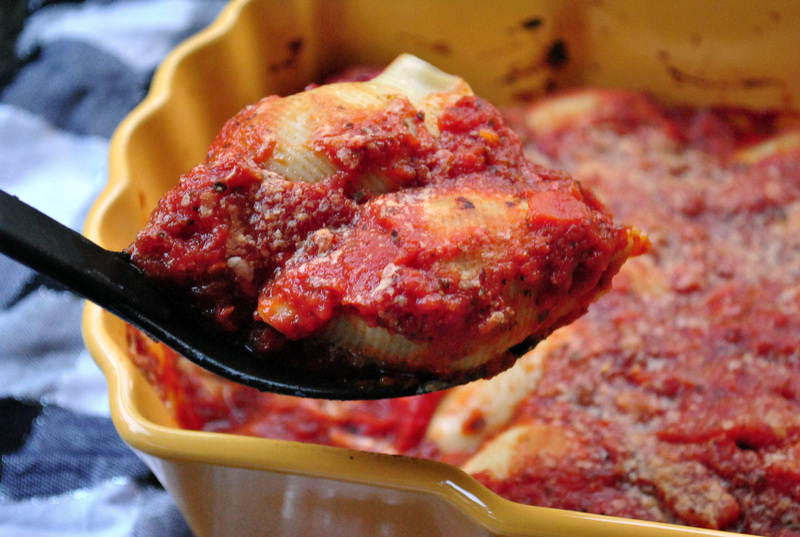 Vegan Stuffed Shells: The husband ate a few servings of these before I told him they were vegan…and then he kept on eating! 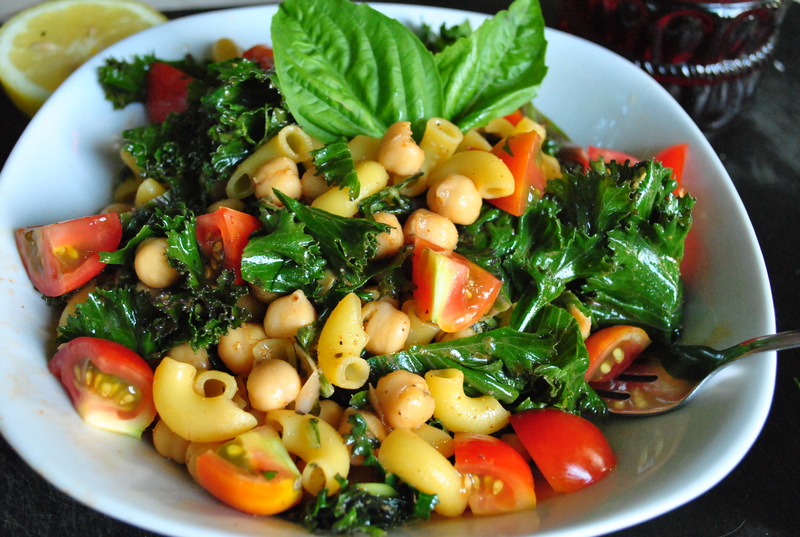 Moroccan Inspired Vegan Pasta Salad: One of my favorite summertime pasta salads. 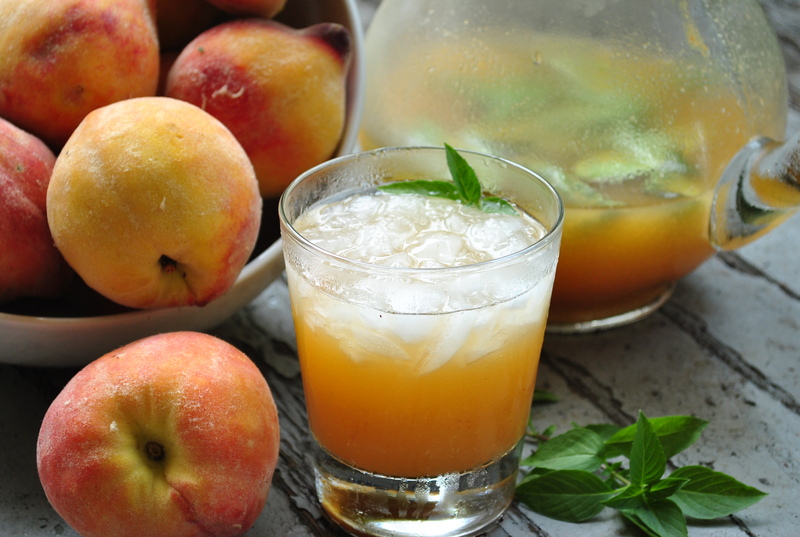 Feel free to link up to your own recipes or other great recipes/blogs/etc/ in the comments! Happy Thursday! Friday is almost here which means the weekend isn’t far off. I’ll be honest – I completely forgot that the Superbowl was this weekend. We don’t really watch football (or even have cable for that matter) and really, the Superbowl has always been about the beer and the food for me. And the commercials. Anyone have any big plans for the Superbowl? The husband will be working what is sure to be an insane shift and I will probably be deep in the black hole that is photo editing. 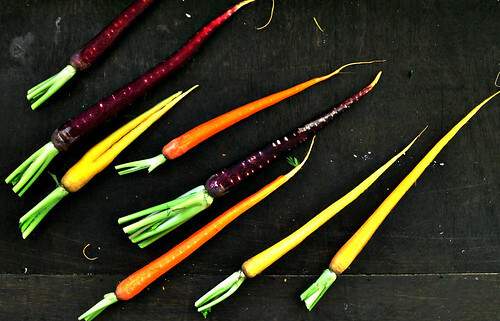 It’s a bit ironic that some of the most vibrant hued fruits and vegetables come about during the dark and grey winter. Although in Richmond, our winter has been far from dark and grey. I’m typing this while sitting on my deck and sipping some decaf mango green tea in short sleeves. In January. It’s a bit crazy. I don’t know where winter has gone, but I think I can live without it if it stays like this. 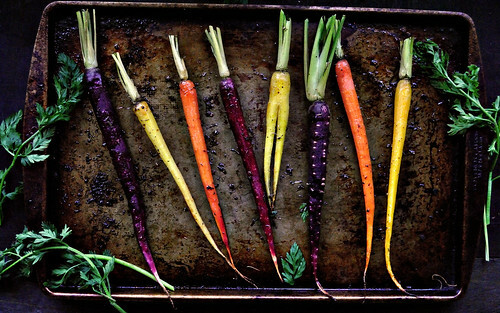 I’ll take the spring weather and brightly colored veggies, like these carrots, any day. 2. Peel carrots and trim leafy tops. Place on a baking sheet slightly spaced apart. 3. In a small bowl, whisk together all ingredients and lightly drizzle over the carrots. 4. 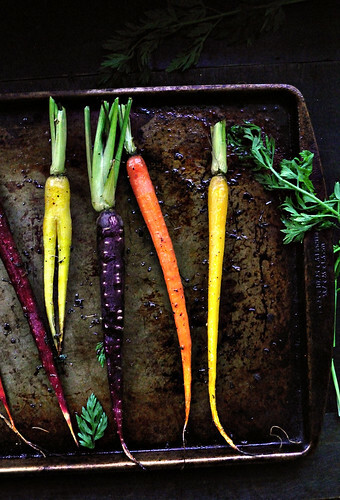 Give the carrots another pinch of salt and fresh black pepper. 5. Roast for 15-20 minutes, depending on size of carrots, until easily pierced with a fork but still firm. I wish I had adequate words to describe this dish…but I don’t. My mind is exhausted from planning photo shoots and recipe writing and I just can’t seem to muster up any elegant way to describe this dish. Well that, and I’m too busy eating sweet, fragrant blood oranges. Swoon. 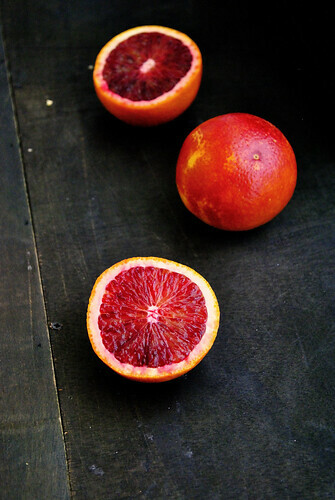 I picked up a few blood oranges the other day and immediately started thinking of what to make with them. Too many options led to me to the conclusion that I should probably just buy all the blood oranges in Richmond and make every type of marmalade, sorbet, cake, infused liquor (!!!! ), and pot de crème under the sun. I contemplated just eating all of them in one sitting and then, I remembered dutch babies. 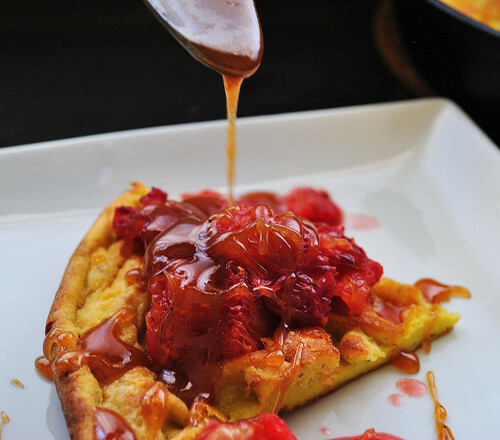 Dutch babies aka German pancakes aka thick, fluffy crepe-like pillows of goodness are an easy, diverse, and elegant breakfast. 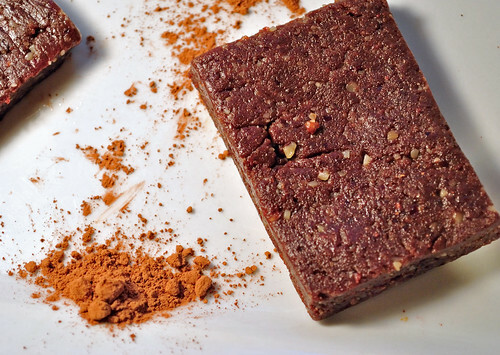 I haven’t had one in ages but this post from Smitten Kitchen convinced me that I needed one, immediately. Topped with caramel, please. 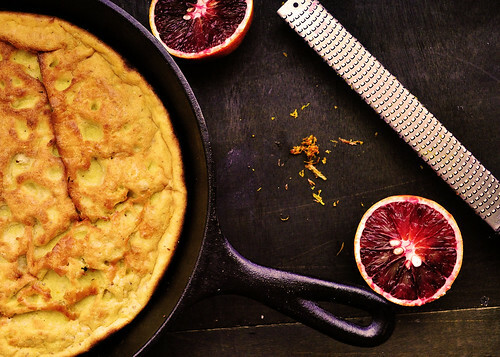 So, I decided to give in to my dutch baby craving (that sounds borderline wrong) and make one that features blood oranges in every component. 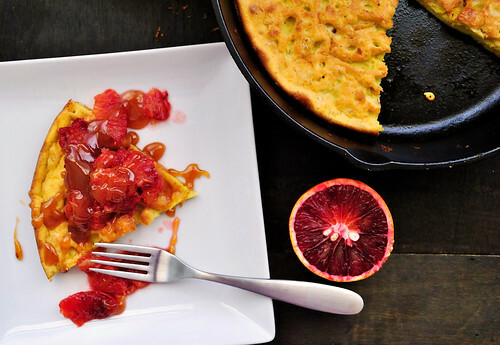 Blood orange zest and juice in the batter with a simple blood orange topping, all smothered in a blood orange caramel syrup. Oh, did I mention it’s dairy-free too? Trust me, you’re going to want to make this. 1. Preheat your oven to 425F and place cast iron skillet or other oven safe skillet in the oven. 2. Make sure your eggs and milk are at room temperature – it helps the dutch baby get fluffy. Combine all ingredients into a large bowl and whisk together until smooth. 3. Once oven is preheated, remove skillet and carefully add coconut oil. I used 3 Tbsp because my cast iron isn’t well seasoned yet, you made need less if you have a well seasoned skillet. Swirl oil around pan being sure to bring it up the sides. 4. Add batter to hot pan and bake for 15-17 minutes until puffy and golden. 5. Remove from oven and cool, it will sink at this point. 1. 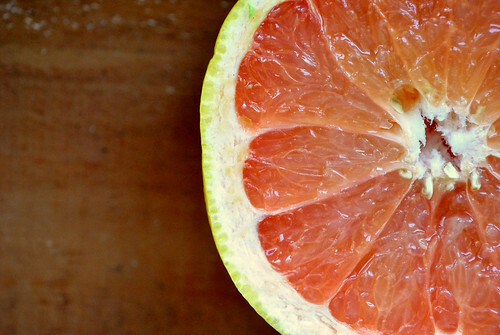 Segment your orange. Check out this tutorial if you aren’t sure how! 2. Add all ingredients to a small bowl and gently stir to combine. 1. 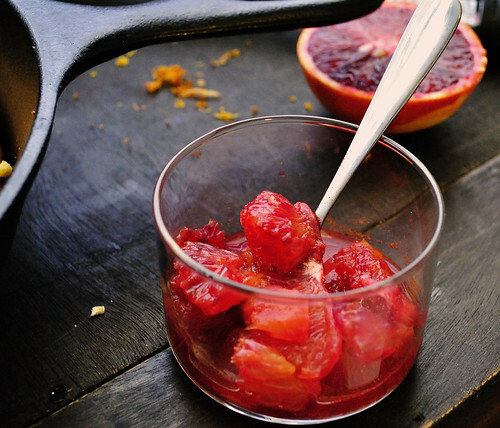 Combine sugar, water, and blood orange juice in a medium saucepan. Heat over medium high heat and bring to a boil, without stirring. 2. Once the mix has deepened in color (just a few minutes), shut off heat and carefully add soy milk. 3. Return to medium high heat and boil again for about 2-3 minutes, whisking occasionally. 4. 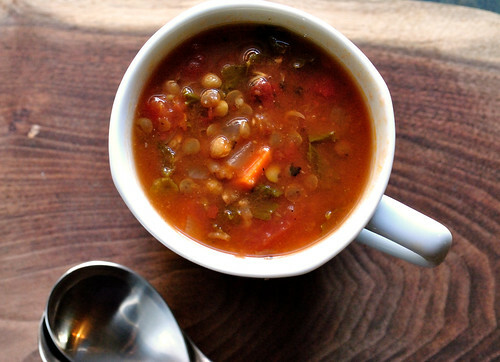 Remove from heat and carefully pour into a bowl or small dish. 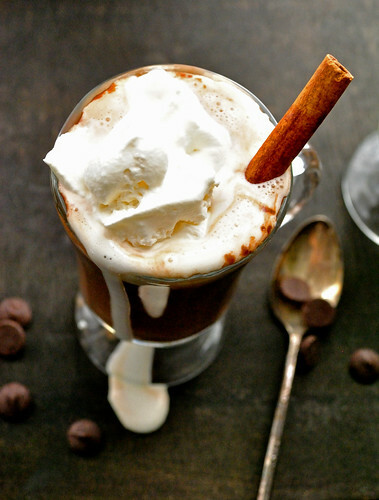 If the caramel begins to harden, simply pop in the microwave for 10 seconds to warm up. Happy Thursday! Friday is almost here! Woohoo! We are nearing the end of January which means that most of us are one-month into our New Year’s resolutions. How are you doing on your goals? I feel like I’m making progress towards each of my goals, albeit at different speeds. One of my main goals was prepping and planning ahead, which I have been doing great with! It’s really made my life during the work week a lot easier and has freed up some precious time. Besides doing my weekly prep and using my favorite grocery service, one of the things that has helped me stay on track is having a meal “template” for my day. One of the questions I get asked most often about gluten-free living is simply, “What do you eat?!”. 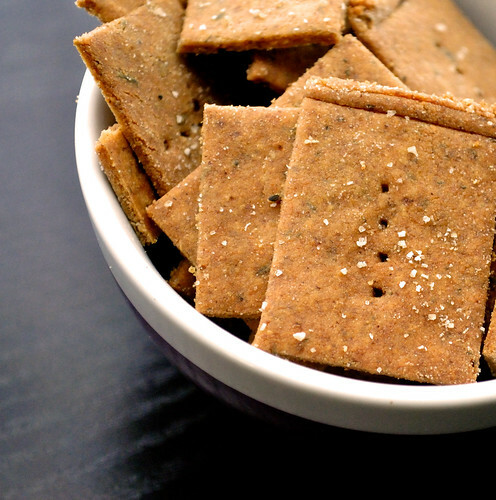 As evidenced by this blog, gluten-free eating is not boring and certainly doesn’t skimp on deliciousness but I feel like many people think living gluten-free every.single.day is impossible. While it’s hard at first, it is definitely possible to eat a healthy, gluten-free diet day in and day out. A long time ago, when I first started this blog, I had a section called “daily eats” where I post what I ate everyday. It helped me with my accountability but took a significant chunk of time, so I ended it even though it was fairly popular. Disclaimer: I am not a nutritionist or registered dietician. These meals are based on my own caloric needs and health requirements based on my personal activity level and resting metabolic rate, which I have had tested by a medical professional. I am also under the care of a nutritionist in conjunction with a sports medicine doctor for various health reasons. 6-7:30am: workout time! I usually do about 50 minutes of weight lifting with cardio bursts and follow it with 20-30 HIIT cardio. Or I do 60 minutes of cardio, usually spin. 1pm: lunch time! I usually have some sort of salad (I’m on the third day in a row of eating this) with tuna, salmon, beans, or tofu. Or some soup. 4pm: snack: some edamame or carrots & hummus. 6:30-7:45pm: 75 minute vinyasa yoga (not every day, but I shoot for 2-3 days a week! ), I may have a small snack afterwards if I’m not eating dinner right away or a larger afternoon snack. 8:30pm: dinner: this varies greatly but usually involves roasted veggies, some sort of fish/tofu/beans/chicken, and a small amount of quinoa or brown rice and possibly a glass of wine. That’s my meal template for work week. The weekends vary a little bit but I generally still eat about 4-6 times a day, depending on what I’m doing. Do you have a meal template? Do you think they’re helpful? It’s been an insanely busy Tuesday – I think I have gotten more done just today than I have in weeks! Suffice it to say, I’m ready to curl up on the couch with a glass of wine and an easy dinner before faceplanting straight into bed. On the menu tonight? This salad…which I already had for lunch. What can I say? When I like something, I want it all the time. 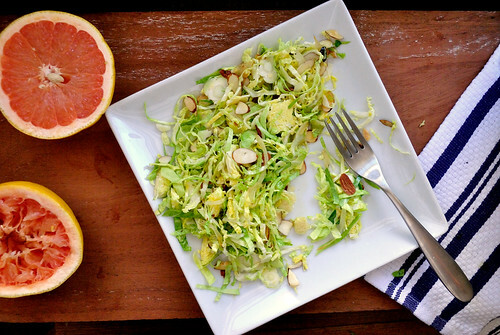 If you’ve never had shredded brussel sprouts, get ready for a serious treat. When sliced whisper thin, these little mini cabbages are crunchy, slaw-like ribbons just begging for a yummy dressing. The best part? 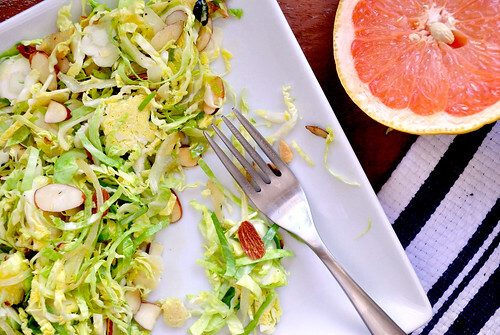 This recipe makes leftovers for days – just keep the dressing and almonds separate and dress immediately before eating. Now, my couch is calling my name! 1. Add olive oil to a large pan and heat over medium-low heat. Add thinly sliced onions and cook, very, very, slowly on low heat until caramelized. This takes awhile, so you can do this ahead of time! Once they’re finished, shut off the heat and set aside. 2. Rinse and clean your brussel sprouts. Slice them very thinly with a sharp knife or use a mandoline. 3. 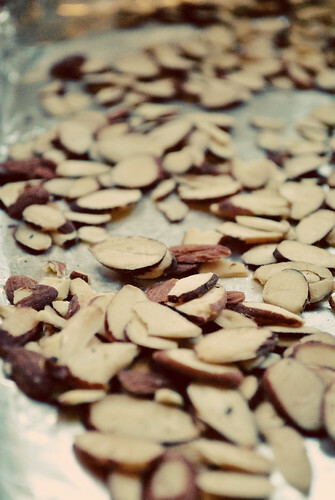 Toast your almonds with a pinch of salt in a toaster oven, oven at 325, or in a warm dry pan for a few moments. They toast quickly so don’t go far! You should just be able to smell them and they should be very lightly browned. Set them aside. 4. 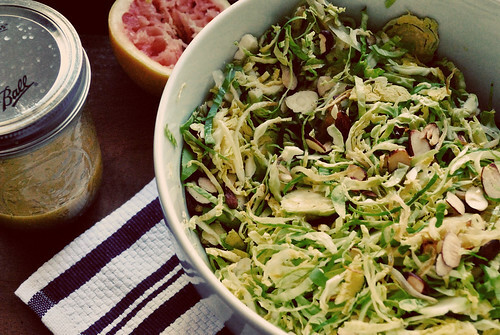 In a large bowl, combine the shredded sprouts, onions, and almonds. Add a pinch of salt and mix to combine. 5. In a mason jar, add all dressing ingredients expect olive oil. Give it a shake! Add the oil in and shake vigorously. 6. 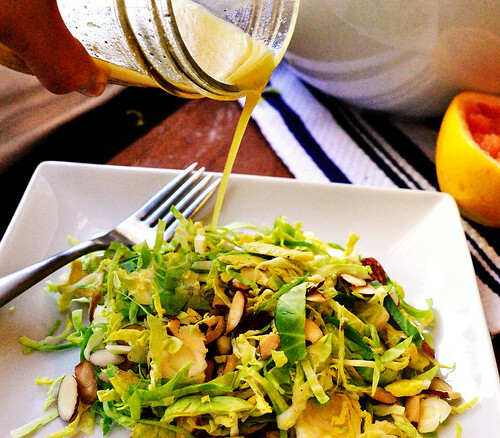 Plate your salad and drizzle some dressing over the top, shaking the dressing if it’s separated. I don’t recommend dressing the salad ahead of serving time – it may make the sprouts taste a bit off. 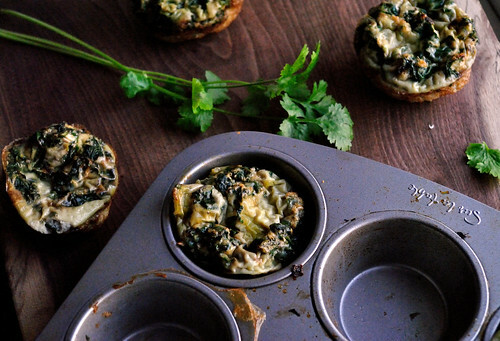 Add some tofu or salmon for a complete dinner or lunch!